GETTING READY FOR THE SEASON WITH A NEW OWNER. The Düsseldorf-based project developer 12.18. Investment Management is investing around 35 million euros in the revitalisation and expansion of the property, which will be operated by the subsidiary 12.18. Hotel Management from next year. 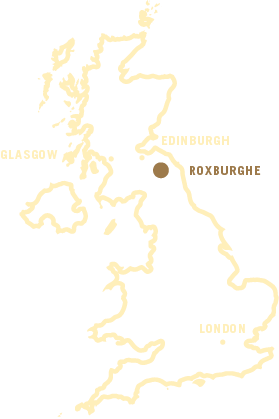 Together with Babcock Pensionskasse VVaG one becomes the new owner of the Scottish Roxburghe Hotel & Golf Course in the region "Scottish Borders", not far from the border to England. The managing partners Jörg Lindner and Kai Richter signed the purchase contract with the former owner, the Duke of Roxburghe, in Edinburgh. "We are delighted with our new investment in Scotland and are convinced that the acquisition of the Roxburghe Hotel & Golf Course will not only enrich our own portfolio, but will also be profitable for the entire region," says Kai Richter. Hans-Hermann Vowinkel, Chairman of the Management Board of Babcock Pensionskasse, adds: "This property is a promising investment with a proven partner. One of Scotland’s most charming country houses, the 19th century property currently comprises 22 rooms, restaurant and bar; 12.18. aims to enhance this with an extensive refurbishment, building a separate extension to feature 57 additional rooms as well as a luxurious spa and a state-of-the-art meeting space. In addition, 60 lodges will be built on the surrounding estate and be made available for sale to private investors through a sale-and-lease-back concept that will allow the new SCHLOSS Roxburghe to extend its room inventory further to holiday-makers. Throughout the hotel, golf club house and lodges, 12.18. will be engaging Kitzig Interior De-sign with whom they have worked extensively throughout their existing hospitality portfolio. Edinburgh based company ISA architects has been engaged for the architectural design and master-planning of the new buildings. ISA is an award-winning architecture and interior de-sign practice working across the UK for some of the country´s leading businesses. Whilst the original building will continue to impress with its stylish Scottish elegance, the extension housing the additional rooms, spa and meeting facilities will provide a contrast with a more modern construction that still remains in harmony with the beautiful surroundings. The golf club house including the gastronomy and pro-shop shall also be revitalised and get a modern make-over after the summer season. The hotel will be closed during the period of redevelopment (the Golf Course and Clubhouse will continue to operate as normal). Some hotel staff will be redeployed during this time or offered alternative employment at other 12.18 properties. All staff will have the opportunity to be re-engaged when the hotel re-opens. Detailed consultation with staff will be undertaken in advance of any closure. 12.18. is experienced in regenerating historic properties, having launched castle hotel SCHLOSS Fleesensee in the heart of the Mecklenburg Lake District together with one of Northern Europe’s biggest golf resorts including five courses and a golf academy. Roxburghe Hotel & Golf Course will be the second property under 12.18.’s new brand ‘SCHLOSS Hotel’. The company is interested in acquiring additional historic touristic properties within the UK to complement the portfolio and support the growth of the brand.